Latin Lady Bi-Color Rose has white on the outside of the petals and red on the inside. 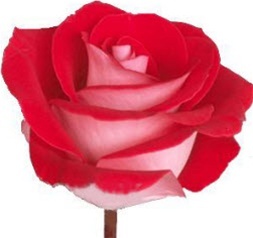 Latin Lady Bi-Color fresh wholesale roses have medium-to-large heads, which open fully into a classic-shaped bloom. Latin Lady Bi-Color Roses are a favorite for wedding bouquets, floral arrangements and lavish centerpieces. We ship fresh from our farms in Colombia and Ecuador at wholesale prices. FedEx shipping is free!